The year is 2017 and we’ve left the age of information for the age of experience. Data is driving and informing how you experience each moment of your day from the very broad, macro level like buying a car or how you shop for groceries to the very micro, intimate details of your life. Experience is everything. There are few experiences more personal than the way a person interacts with their own home, but that experience is beginning to change as well. For decades, the smart home has been a key component on the imaginative spectrum of “The Future.” This stylized vision of home automation has been depicted as a nightmare, to a thrilling necessity. Only recently has the smart home transitioned to practical reality. However, it looks a bit different than many of the creative visionaries predicted, mainly in the way that today’s smart home is not glaringly different from any other home – in many cases it is a completely seamless, agile experience. Kyle Bradshaw, Manager in the Strategy Community at Revel Consulting, designed his own smart home – although that wasn’t his initial intent. The project-turned-passion began a couple years ago when he and his wife felt dissatisfied with the service provided by their home security provider. Kyle, being tech savvy and forward-thinking, decided he could build something himself that was a better custom fit to their needs and less expensive considering it wouldn’t require a monitoring contract or subscription. His journey to change his home experience began with finding the purpose for the transition. 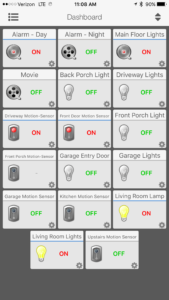 He stresses, “for anyone getting started, it’s important to find your main use and go from there.” For Kyle, it was home security; an ISY Controller, a few Insteon Door Sensors, Motion Sensors, light switches and a couple wireless cameras later he was on his way to a seamless, personalized security system. From there he continued to add functions to further customize his home. The entire system interfaces on all his iOS devices, effortlessly accessing cameras, lights, HVAC and the alarm system from the palm of his hand. The desired experience with the system was to be transparent to all members of the house, down to his 3-year-old child. For example, turning on the nighttime alarm system when people go to bed cues the house to lower the heat, turn off interior lights, and of course arm the alarm – in one step, he can set up the house for the family’s nighttime routine, and enable the morning wake-up routine with a press of the same button. The idea is simplicity of use, the house being able to seamlessly work with Kyle and his family’s needs without too much thought or effort. There are dozens of commands built into the system to make life just a little bit easier. He introduced a geofence that knows if both his and his wife’s iPhones are more than 50 miles away from home, the house will adjust the thermostat to “vacation mode,” arm the alarms, and have the lights on timers to make the house appear occupied – all this happens without even a button pressed. It just works. For something so useful and convenient, one would presume there are some significant barriers to entry, but those are disappearing. Although Bill Gates spent more than $100 million building his smart home, Kyle claims that cost is no longer prohibitive, and that a bare-bones smart home automation would be possible for less than $500; his entire integrated system cost him less than $1500. According to Kyle, one barrier people may run up against is the set up – having to integrate it all yourself may not be realistic for everyone, but there are countless services to assist you for a bit of extra cost. At this cost to value ratio, it’s easy to see that the smart home experience will be more and more widely adopted in the coming years, and there’s room to grow. What would Kyle add to his home next? Adaptations are available to monitor and analyze energy consumption by room and by device for efficiency – just one more way Kyle would like to alter his home to be cost effective with the added bonus of being environmentally conscious. Revel Consulting is home to many innovators and thought leaders so it’s no surprise that Kyle and many other Revelers are enthusiastic about outfitting their homes in the latest automation technology. Many of the attributes that come into play when designing an integrated smart home experience are the same pillars used every day at Revel. This seamless home experience runs parallel to the ubiquitous experiences we help our clients provide their customers, and the agility of customization is paramount to both home automation and modern, digital business transformation; Revel helps clients strategically transition from simply having customer information to creating meaningful customer experiences, and how better to provide that service than with people who practice custom experience building in their own lives, and even their own homes. We’re proud to house so many early adopters within our firm, and designing custom smart homes seems to be the latest experience to personalize and embrace. Tip: through API people can build their own IOT devices with Raspberry PI. Many cloud service providers such as AWS and Azure have, solutions and services specifically for IoT.